NextGen’s motto is attract, entertain, retain and they have been living up to this moniker quite consistently. With 137 slots already under their belt, you wouldn’t blame them for dropping the ball now and again, but rarely have they disappointed in their past catalogue. 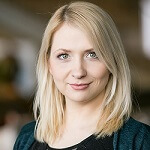 They have really pushed the boundaries with their slot themes, whether it’s creating lovable characters as with the Foxin Wins games, Fat Cat or Funky Chicken or when they offer massive jackpots as with Medusa 2 and Thunderspin Jackpots. With the high end titles the company has been releasing in the last few months, a title like Olympic Thunder can easily fall through the cracks. Nextgen has released games like Dragon Wins, Wonder Hounds, and Cleo’s Wish in the last three months alone so it’s safe to assume that Olympus Thunder will simply fade into their slot catalogue. This would be a definite tragedy as this future sleeper hit knows how to keep things simple and rewarding. It offers players a 97% RTP and a simple 5×3, 20 payline reel design. Even with a 50 000 jackpot there is still a low minimum wager of 0.20 on offer and a maximum wager amount of 100. 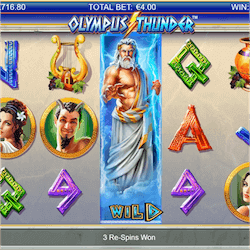 The Greek god theme of this slot is nothing new. The reel icons feature a satyr, a maiden and Zeus as an expanding wild icon. The rest of the icons are made up of playing card symbols. This may not sound exciting or original, but in Olympus Thunder this simplicity just works. This is definitely one of those times that NextGen have knocked it out the park without even trying. Zeus is the main character in this slot and he is behind many of the special features NextGen have added in. The god will act as a substitute wild, altering fate in your favour for some great rewards. He can also give you three re-spins whenever he lands on the middle reel. He will expand and remain in place as a giant stacked wild until all the re-spins have completed. The main bonus game that players can look forward to is the Olympus Bonus round. You must match symbols hidden under coins in order to win up to 20 free spins with a 3x multiplier active. As we said, Olympus Thunder can easily be missed by slot players in such a tough market, especially when NextGen has been on fire with their releases recently. Its high RTP and straightforward approach to slot mechanics should not be ignored though, seek this one out.